Marketing Communications for Mergers and Acquisitions: What Could Go Wrong? Do you lead marketing for a company that is growing through acquisition? If so, you face a specific set of marketing and communications challenges. The first and foremost of these is that too often, companies involve their marketing departments after the decisions have been made and dates have been set. Yet the transaction is more likely to be successful and profitable if marketers have the time and information necessary to develop a full pre- and post-acquisition marketing and communications plan a few months before ‘Day 1’, when the official press release announcing the deal is distributed. With experts predicting that the long-awaited boom in mergers and acquisitions is coming, seasoned marketers are dusting off their M&A related marketing folders, and retrieving those archived marketing plans from that 2007 corporate merger. 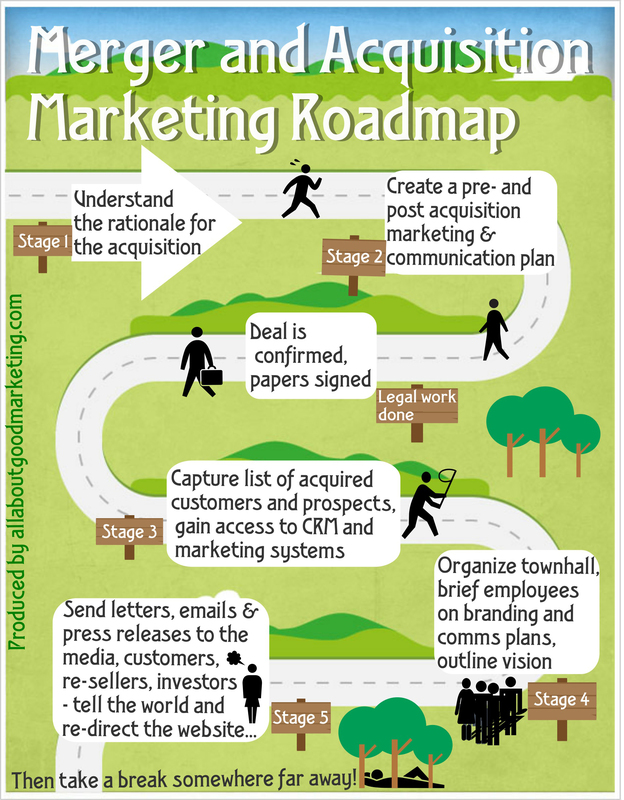 So next time the CEO’s PA calls you into his office, be prepared and take a printout of the below Mergers and Acquisitions Marketing Roadmap with you as a rough guide to how the marketing department will support the corporate objectives related to the merger or acquisition. Sales enablement programs to ensure that the sales teams understand the cross-selling opportunities created by the acquisition and can confidently communicate the benefits of the expanded product range. A strong and strategic marketing and communications plan can make a real difference to the success of mergers and acquisitions. A weak one plan can destroy value, damage the brand of the acquirer and can drive business to your competitors. This entry was posted in Marketing, Marketing Plans, Marketing Strategy and tagged Internal communication, marketing plans, valueproposition. Bookmark the permalink. This is a really interesting post and I’m going to link to it via the Insight2Marketing Google+ page. Didn’t even know about Quaker Oats and Snapple!